Horses are safe in BroadShield’s metal horse barns. 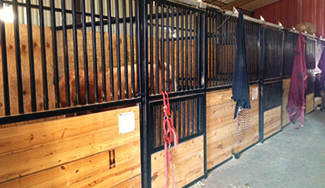 Our metal barns, fencing systems, and horse stalls are safe and durable. Knowing horses and how they behave is important in choosing the right steel barns and fencing for your acreage. Horses tend to push and test fence structures, but with the right materials and design, they are effective and adaptable. We trust flex rail systems for your horse fencing needs because it is industry accepted as well as being the best material for the job. Popular adaptations to horse fencing are below. While every type has its own qualities, we encourage you to speak with our project manager to assess what fence is best for your horses and your budget.